Do you only have 24 hours in Munich? Have you been confronted with over a hundred things to see and do, and you’re not sure where to even begin? Or maybe you’re planning on spending a handful of days in Bavaria’s capital, and you want to make sure that you don’t miss the good stuff? 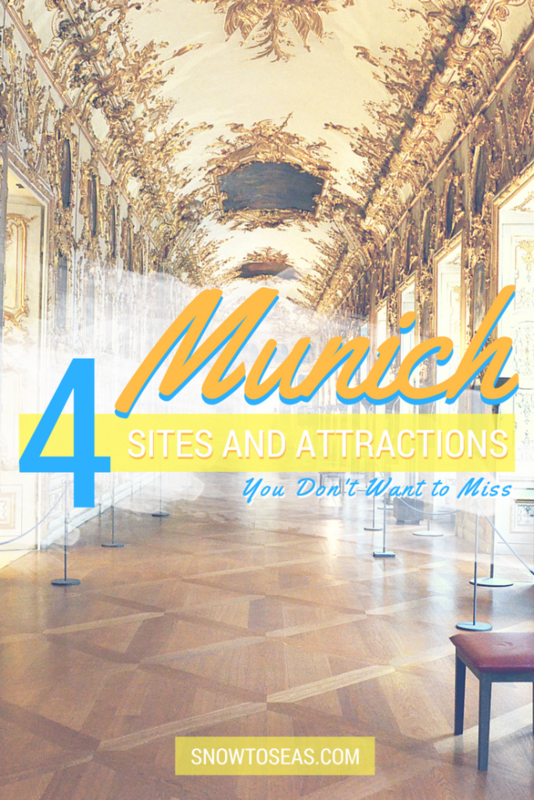 Regardless of the duration or purpose of your visit, if you enjoy a good view and a good brew, I’m going to tell you about 4 sites and attractions in Munich you don’t want to miss. 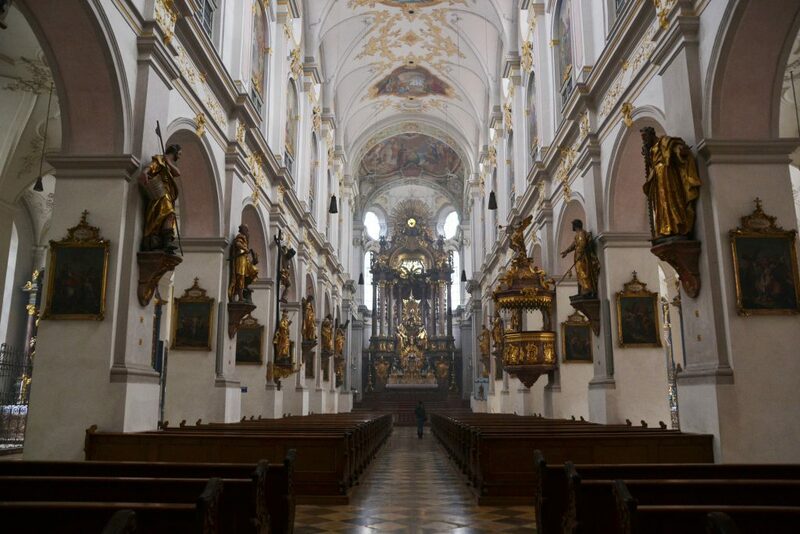 St Peter’s Church, locally referred to as Old Peter (Alter Peter), is in Munich’s Old Town. The church is around 1,000 years old and has undergone many transformations during the past millennium. In addition to having a remarkable interior (it’s an amalgamation of artistic styles), the church also has a tower that visitors can climb up in order to access an observation deck. Going up the tower to the observation deck costs only 3 Euros. 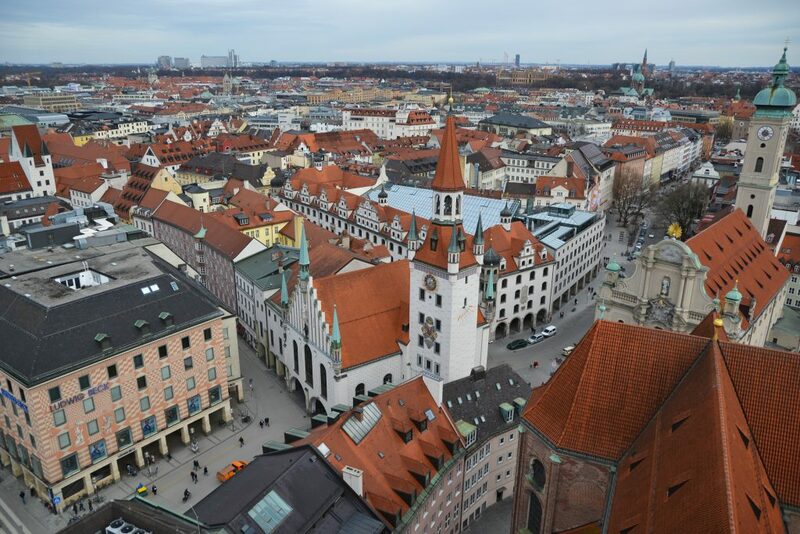 From the top, you can experience the perfect bird’s-eye view of Munich’s Old Town. On one side of the tower, you can even catch a glimpse of the Alps (mostly on clear days). Can you see the Alps along the horizon? If you’ve read a few of my other posts, such as the ones about Warsaw, Turin, Venice or even Sarajevo, you’ll know how much I love panoramic views. I definitely could not skip a trip up the tower. 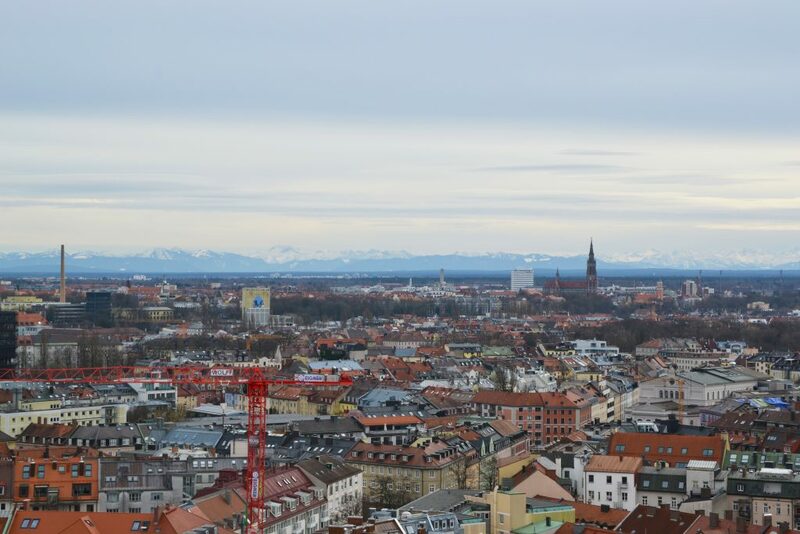 If you want to catch one of the best views of Munich, you shouldn’t either. For information regarding the tower’s opening and closing times, you can visit Munich’s city information website by clicking here. Please note that in order to reach the observation deck, you must climb nearly 300 steps. Climbing up may take a little bit longer than expected, especially if you let visitors heading down pass you on the narrow stairs. However, the view at the top is definitely worth the effort. Marienplatz is a large square in the heart of Munich’s historic Old Town. Often, it’s where the party is at because the city holds many of its festivities there. During my visit at the end of February, the city was celebrating Fasching (Carnival in Southern Germany), so of course, hundreds of wildly costumed, alcohol-consuming people gathered in Marienplatz to celebrate the occasion. 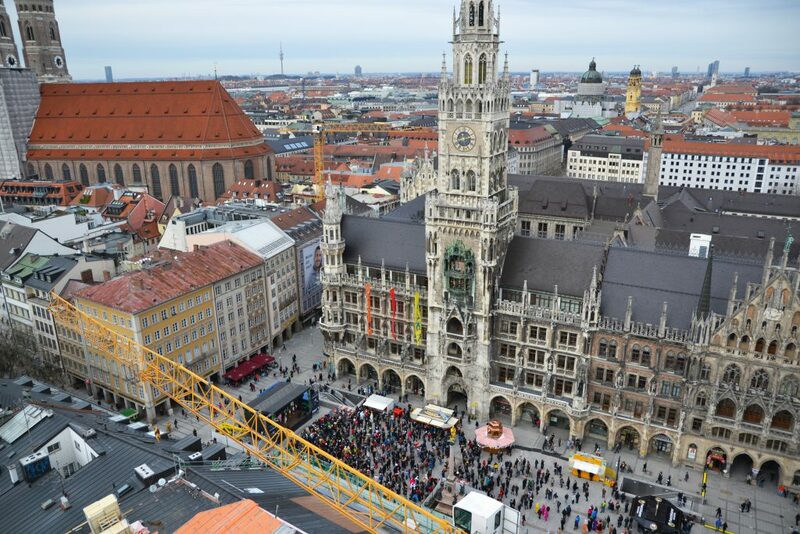 Other notable events that will take place in or around Marienplatz this year, 2017, include the City Foundation Festival in June and the annual Christmas Market in December. Around this downtown city square, you can also see and admire the old and new town halls. However, appearances are deceiving. The medieval-looking town hall found on the northeastern side of the square is hundreds of years newer than the old town hall found on the eastern side of the square. In fact, the new town hall, Neues Rathaus, was only built in the late 19th century. If you happen to be in Marienplatz at 11:00 am (or 12:00 pm and 5:00 pm in the summer), you can enjoy the Rathaus-Glockenspiel’s show. The figures on the New City Hall’s tower come to life and reenact events from the city’s history. 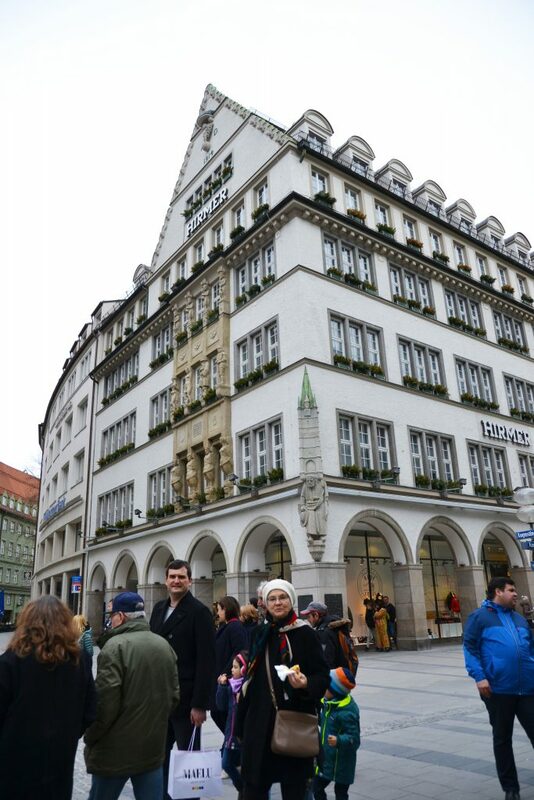 On the western side of Marienplatz, you can access Munich’s pedestrian shopping street, Kaufingerstrasse. 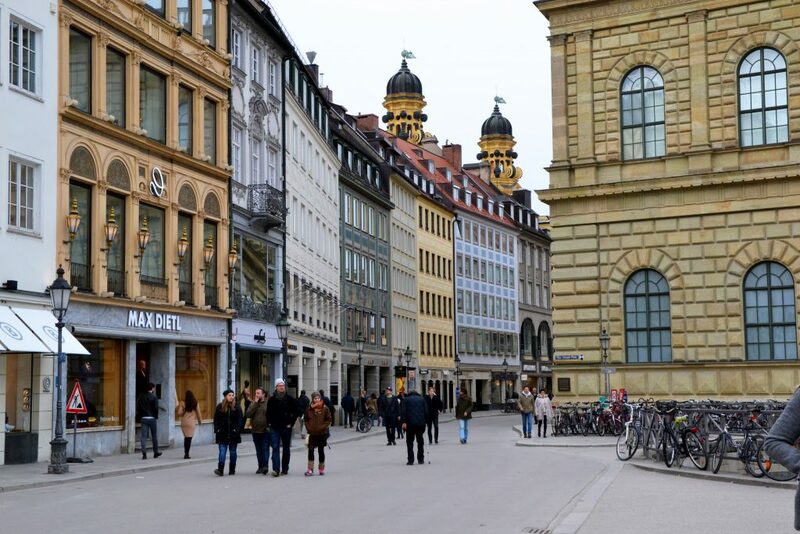 Moreover, if you continue down any street from Marienplatz, you can keep exploring the city’s lovely old town. 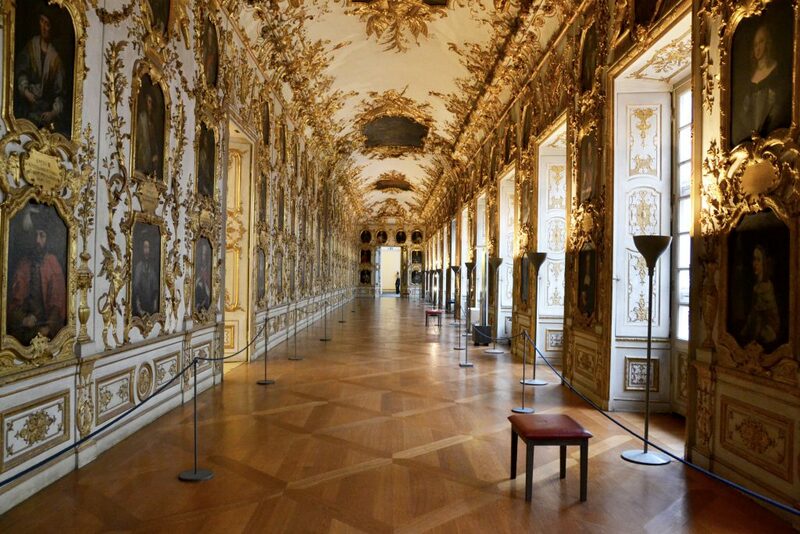 I’m sure you’ve heard of Versailles, but have you heard of the Munich Residence? The Munich Residence was where Bavarian kings, dukes, and other individuals in power lived and ruled between 1508 and 1918. In my opinion, the elegance and brilliance of the Residence is comparable to that of Versailles. If you don’t believe me, scroll straight down to the photos. You can spend a whole day exploring the Residence buildings and grounds. In addition to the Residence Museum, you can walk around the Cuvilliés Theatre, treasury, courtyards and other halls depending on the ticket you buy. I purchased the Residence Museum ticket and was able to entre the main rooms, halls and living quarters of past rulers. 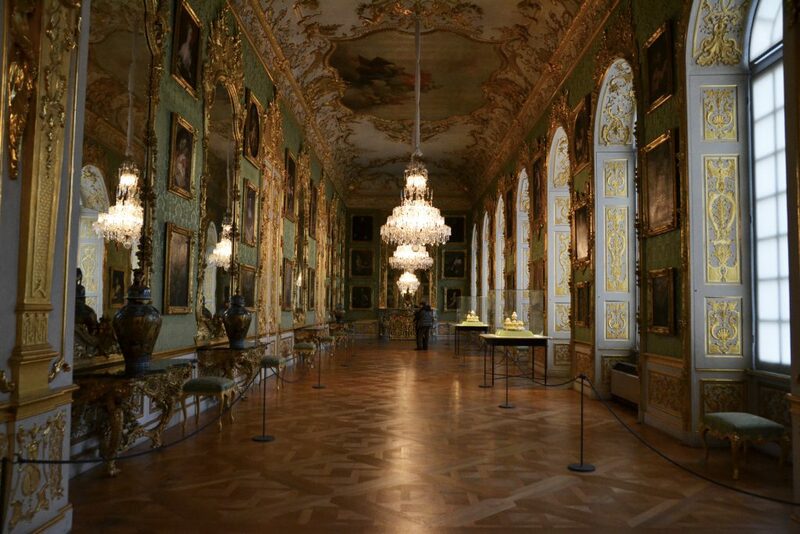 It took me nearly two hours to explore it all, so I highly recommend visiting the Munich Residence at least two hours before closing (and that’s if your not planning on exploring any other part than the Residence Museum). A significant portion of the Munich Residence was destroyed during the Second World War and has slowly been rebuilt and restored. The Green Gallery was one of the affected rooms. Click here to check out opening hours and here to look into admission costs on the Residence’s official site. I’ve spent a lot of time writing about good views, so now it’s time to write about good brews. It’s common knowledge that Germans love their beer (does Oktoberfest ring a bell?). In fact, Germans have loved their beer for quite some time. The Hofbräuhaus am Platzl is a traditional German beer hall in Munich’s Old town. 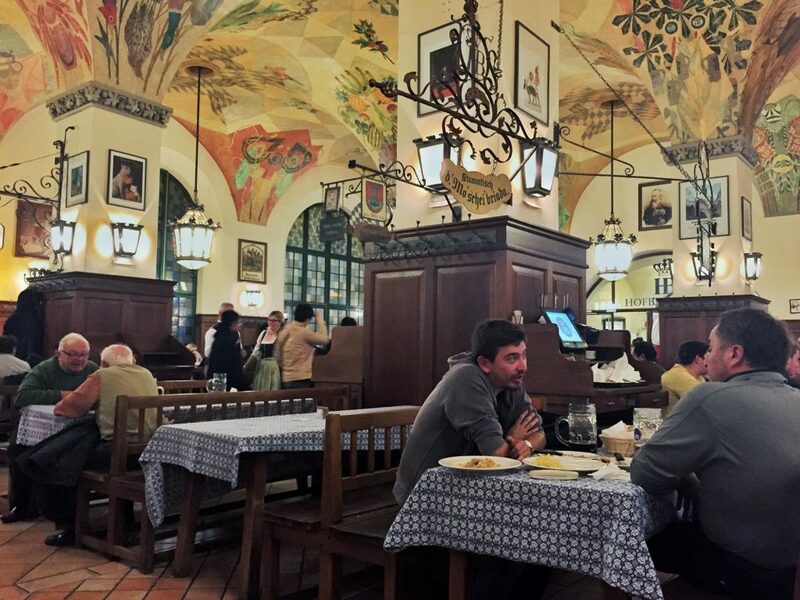 It’s actually one of Munich’s oldest beer halls. It’s been in business for just under 500 years and open to the public for nearly 200 years. In addition to indulging on beers brewed from the Hofbräu München Brewery’s 16th century recipes, you can feast on some Bavarian food. Be warned that most beers are only available in 1 litre portions (so food was a necessity for 5’2” me). I didn’t want my DSLR to be in such close proximity to hundreds of litres of beer. iPhone photos will have to do. The main beer hall in the Hofbräuhaus. Similar to the Munich Residence, only a small part of the beer hall escaped destruction during WWII. I have a soft spot for the Hofbräu Münchner Weisse. I visited Munich at the end of February. The city greeted me with mild winter weather (a pleasant contrast to my daily Scandinavian winter reality). I busted out the sunglasses and decided to conquer the downtown area on foot. 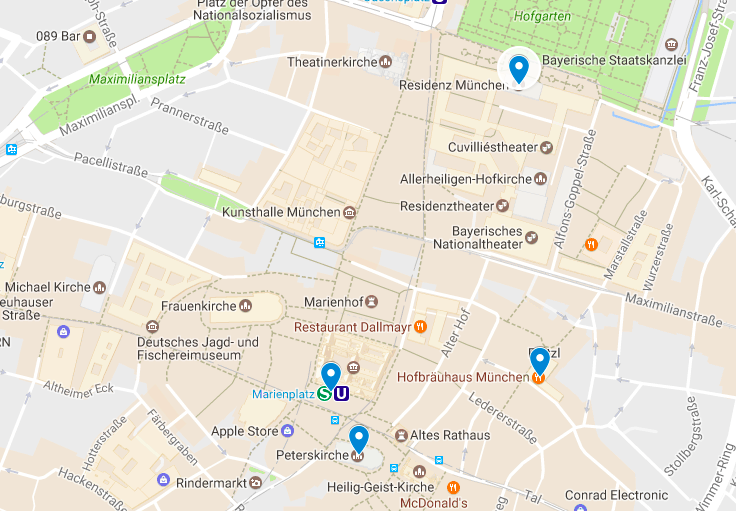 All the sites and attractions listed above are located within Munich’s Old Town, so they are all within walking distance of one another. 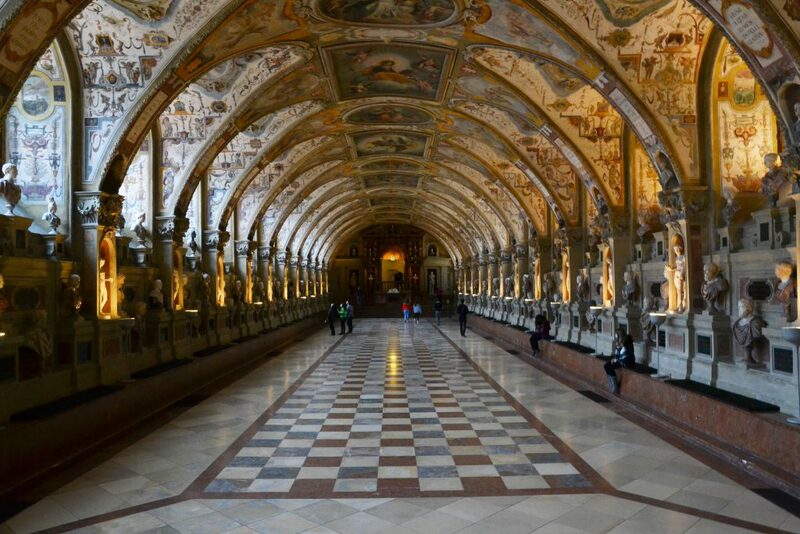 Are there other sites or attractions in Munich that should not be missed? Comment and share them below! Those city views from the top of the tower are absolutely stunning! Munich looks so charming – I’m going to need to see more than the airport soon, that’s as far as I’ve made it into Germany so far! Thank you so much! I hope you do get the chance to go. 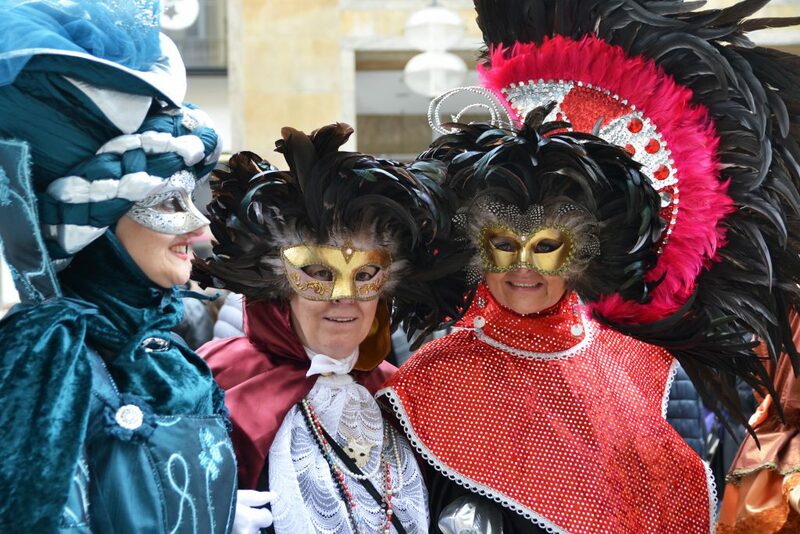 And if I can recommend any time of year – go during Fasching because it’s a blast! Thank you for sharing this post!! 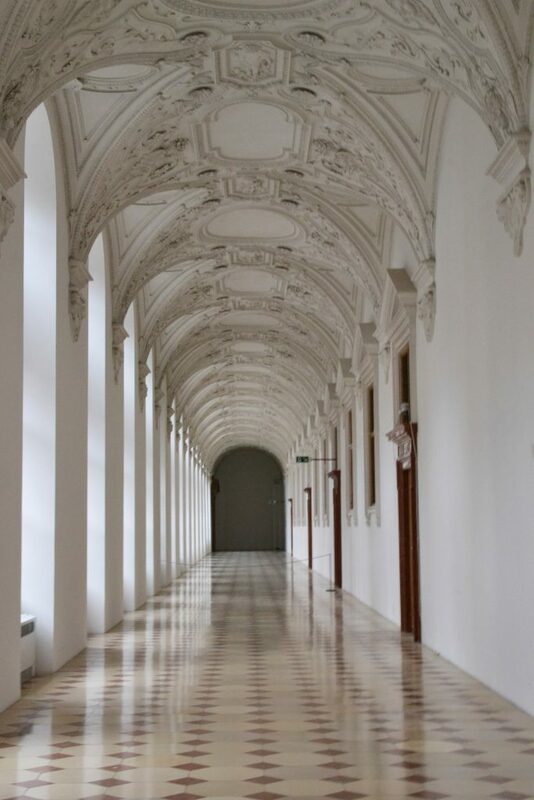 Munich is definitely on my list of places to go and these are some awesome recs. What beautiful architecture! I was born in Munich and still live here so this is a special blogpost to me. It’s interesting how people from outside Munich think in terms of the must-sees here. And as a local I agree with you: You chose a very nice tour. Thank you! I’m the same when it comes to reading posts about Toronto. Happy to hear that you agree! These places look amazing! Especially the Munich Residence! I would love to wander around those bright corridors! I’ve never been to Munich but its high on my list! It really is amazing! I also didn’t know it existed until I started looking up things to see and do in Munich a few days before my trip! I don’t know why it’s not talked about more. I would love to go to Munich one day. I have been to several German cities but never been to Munich so far, but I think it will be one of the best cities to visit. I would like to go to the Hofbräuhaus! 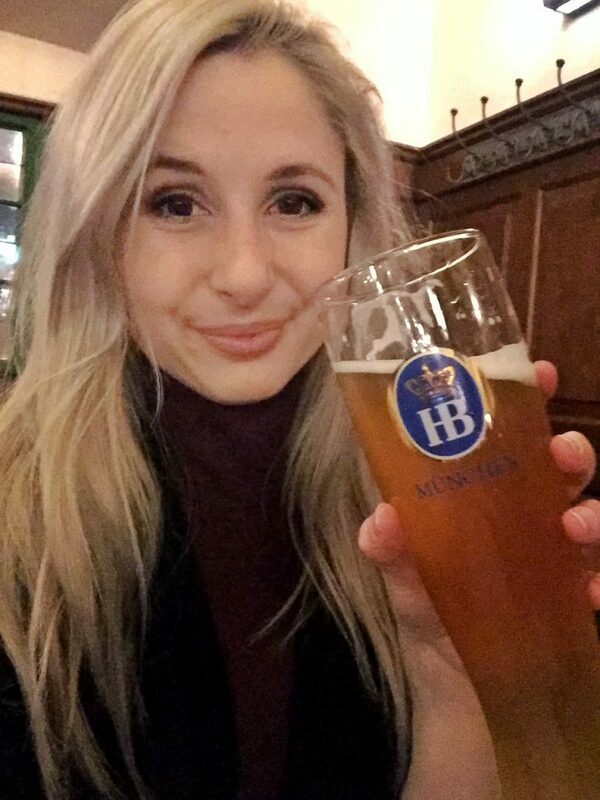 The Hofbräuhaus is an excellent choice! Those places look great, thanks for the recommendations! Those city views were incredible, wow. And the Munich Residence looks so beautiful. I am sure my first choice on the list would be The Munich Residence. The details inside are just stunning. I am a sucker for historic spots whenever I travel. It’s definitely a good first choice! Ahh I am so sorry to hear that! Getting sick while traveling is no fun at all, but your plan sounds like a good one! I visit often Munich and I love to see that in such a short time you succeeded to see the best sightseeings! I thoroughly enjoyed Munich when I was there. I was mainly there for Oktoberfest but did get the chance to sight see a little. I do agree that Marienplatz is a great place to start. Next time I will take your list! munich is always been on my list! I would love to go there this, could you please tell me what would be the best time of a year to go there and experience the beauty? Thank you so much for your comment! The best time to go totally depends on the experience you want. High-season for travel tends to take place in the summer and early fall (due to Oktoberfest). While the city looks stunning in the summer, it can also be quite packed. Spring is a lovely time to go if you want to avoid massive crowds and have fairly nice weather. However, if you want to experience a bit of a party without the craze of Oktoberfest, I would go during Fasching (Carnival) in February. Keep in mind that it can be chilly then! The Munich residence looks so beautiful and royal. Even I would love to climb 300 stairs for those panoramic views. A great post with amazing pictures. Thank you so much! One of the best parts about visiting these sites/attractions was that they were all super affordable too! Thank you for sharing your experience! We are spending 3 days in Munich in a couple of months and plan on doing all of these! I’m excited to visit a brewery and the Munich Residence. You will love both of those places! It is beautiful! And you’re lucky to live so close! There are still so many things I want to see and experience in Bavaria. Earlier today I was talking with a friend and she was telling me how much she wants to visit Munich. I want to visit Munich as well, of course. Actually, I need to do it soon, there is cheap flight that can be found from Sofia to Munich. I am such a view lover, and the view from the church looks awesome. Oh, and the Alps in the background just amazing! Awww – I love Munich! This post has got me all nostalgic. It’s such a lovely city and the surrounding Alps are STUNNING. I’m wishing I was there enjoying a pretzel and brew! Hi, I am from Germany and went to Munich many times. I now live abroad and after reading your blog I got home sick. Thanks for sharing your experience in Munich, truly appreciate it! Aw, sorry for making you miss your home! Where do you live currently?